I know there are many Halloween recipes and ideas going around lately. I have not only enjoyed looking and reading about them but, I have enjoyed brainstorming Halloween inspired desserts! Since I`m a novice baker, I have never actually baked any desserts for Halloween before. I was getting crazy excited about all the possibilities! Ideas I`ve seen on Pinterest and other blogs made me wish I could bake and eat food 24/7! Literally, all day, everyday. Not possible, but I did say I wished. Sadly, time has not been on my side. I`m only taking THREE classes this quarter, which is the norm. I was like, "pshh this quarter is going to be easy peasy." NOT. 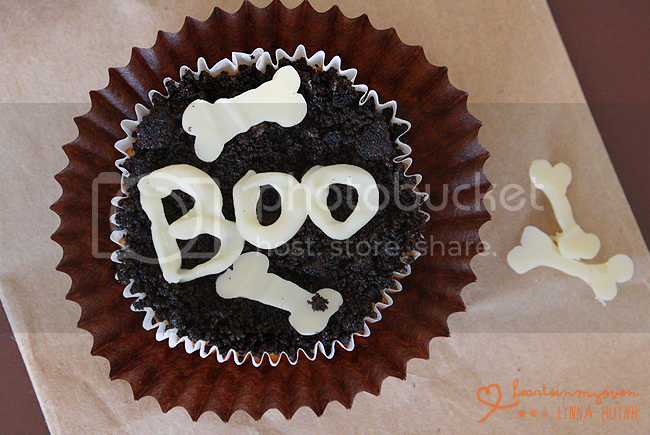 Unfortunately, I haven`t had a lot of chances to bake Halloween inspired desserts to my heart`s content. I did get a chance to make these cheesecake cupcakes though! I think they`re super cute! 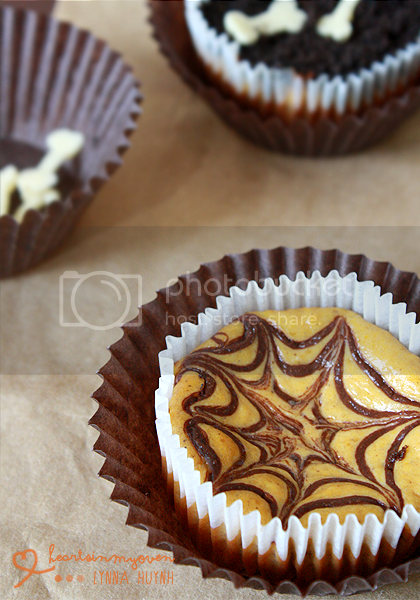 I originally had the idea to make chocolate "spiderwebs" swirls into the cheesecakes, like in the 2nd picture. 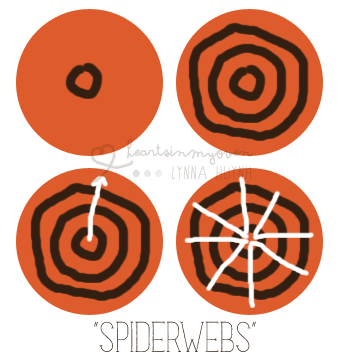 However, I was afraid they might not turn out well, so I only made a few with "spiderwebs". I am glad to announce the spiderwebs idea DID work. I still had a lot of cupcakes, without any decoration though. So, I used leftover Oreo crumbs from the crust to cover the top to make it look like dirt. Then, I melted some white chocolate and piped some skeleton bones on a parchment paper and put them in the freezer to harden. VOILA! After 5 minutes, I had cute little bones! I was terribly happy to have come up with the idea on the spot. LOL. Also, my boyfriend labeled these as Double Oreo Crusted Pumpkin Cheesecakes. I like that name too. 2. Line your muffin pan with liners, or spray with cooking oil. 3. Crumble the Oreo cookies into fine crumbs by using either a blender, food processor, or with a rolling pin. 4. Add the melted butter and mix together to coat cookie crumbs (doing by hand or electronically). 5. Place about 1 tablespoon of crumbs at the bottom of each cupcake liner to form the crust. Press down with fingers to cover the bottom, add more if needed. (Alternatively, you can use the bottom of a measuring cup to press down the crumbs). 6. Bake for 5 minutes. 7. Remove from oven and cool on a cooling rack. 8. Set aside remaining crumbs. 9. In a medium bowl, combine together the brown sugar, pumpkin pie spice, and salt with a whisk. 10. In a large bowl with an electric mixer attachment, beat the softened cream cheese until its smooth at a low speed. 11. Next, add the dry ingredients (sugar, spice mixture) to the cream mixture and mix. 12. Add the eggs one by one, mixing in between each egg. 13. Add the vanilla extract and beat to combine. 14. Add the pumpkin puree and mix. 15. Using a cookie scooper, divide and fill each cupcake liner 2/3 way full. 16. *At this point, if you wish to make the spider webs, melt some chocolate chips into a sandwich bag/pastry bag. If not, skip to step 18. 17. Cut the tip off (make sure it's very small), pipe a small circle at the center of the cupcake. Pipe a bigger circle surrounding the small one. Then, pipe another circle, encircling both smaller circles. 18. From the center of the cupcake, use a toothpick and drag it out towards the edge, pulling the chocolate with it. Do it 7 more times around the circles. It will create a spider web look. 19. Bake for 10 minutes and reduce the temperature to 325F, then continue baking, checking after every 5 minutes until the edges of the cheesecake puff up (about 5-10 more minutes). 20. Remove from oven and let cheesecake cool. If tops are cracked, that's fine. 22. Melt some white chocolate in a pastry bag/sandwich bag and cut the tip off. 23. Pipe some bones, letters, ghosts, or anything you fancy. 24. Place in freezer for 5-10 minutes. 25. 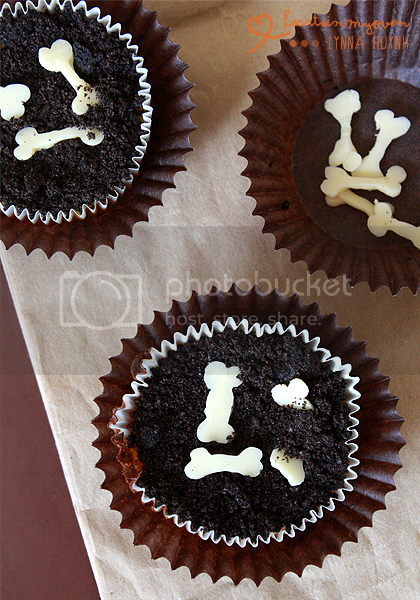 Once your "bones" are ready, top each cupcake with the remaining Oreo crumbs. Make sure all the orange is covered. If you need more, you can just crumble more cookies without the melted butter as well. 26. 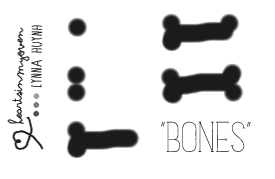 Place the "bones" on top. 27. 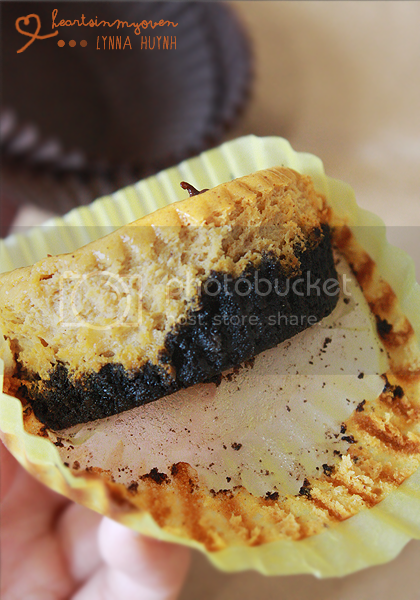 Place cheesecake cupcakes in refrigerator to set for at least 2-3 hours. Leave them in the fridge until you serve them. I love these cupcakes! And I like the cute little diagram you made too! I'm loving the tiny little bones and spider web! 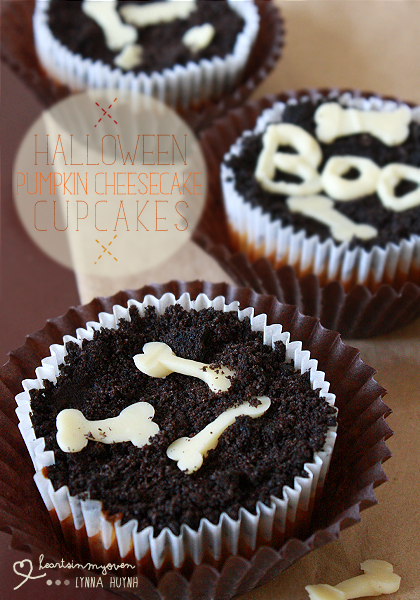 Perfect treats for Halloween! Hehe, thank you so much Nami. I figured the diagrams would help. Wow what an awesome idea. I have only made one type of cupcake in my whole life lol. It is not my forte... but you are so not a novice! It`s definitely not my forte either, but I`m trying to work on my weaknesses. Aww, thank you! :D That puts a smile on my face. Made these minus the decorations for a class party. I forgot to turn the oven down to 325 and baked it for the additional 5 minutes until I realized it (I got distracted)I decided to pull them out after a few more minutes and they turned out okay. Thank you for coming back and telling how the recipe went. :) You`re the 2nd reader who has done so!